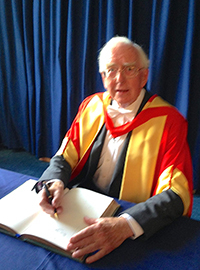 Derek Doyle, Founding Member and Adviser of the IAHPC,OBE, Hon. DSc (Glasgow University), H. DSc. (QMU), FRCSEd. FRCP (Lond. and Edin.) FRCGP, FSA Scot. Dr. Derek Doyle is a founding member of the International Association for Hospice and Palliative Care, his long-time association dating back to when it was a ‘College’ and not yet international. Together with Dr. Roger Woodruff, he co-authored three editions of the Manual of Palliative Care (available to download from the IAHPC website) and continues to contribute to the IAHPC Newsletter. In 2009, he was elected to Lifetime Membership of the IAHPC. Qualifying in medicine at Edinburgh University, Scotland, in 1955, he then went to South Africa where he worked for ten years as a missionary surgeon. Returning to Edinburgh, he spent ten years as an associate specialist/family physician, then the next 20 years planning, and then leading as medical director, Scotland’s first comprehensive hospice/palliative care service in Edinburgh. Dr. Doyle has played a significant role in palliative care, both internationally and nationally, and has been an honorary member of many hospice and palliative care societies. He was the first Vice-Chairman of the European Association for Palliative Care (EAPC) and first Chair of the European Committee for Medical Education and Training in Palliative Care, Other important appointments have included: Founding First Chairman of the Association for Palliative Medicine of Great Britain and Ireland, Vice-Chairman of the National Council for Hospice and Specialist Palliative Care Services in the UK and he remains the Honorary President of the Scottish Partnership for Palliative Care. He has made an impressive contribution to medical publishing as Founding Editor-in Chief of Palliative Medicine (the specialist journal on the subject) and Senior Editor of the first three editions of The Oxford Textbook of Palliative Medicine. Dr Doyle has written/edited 18 books mainly on aspects of palliative medicine, and had more than 60 papers published on palliative medicine and the history of medicine in Scotland. He was also Obituaries Editor and Assistant Editor of the Journal of the Royal College of Physicians of Edinburgh until 2000. Dr Doyle’s immense contribution to the field of hospice and palliative medicine has been recognized throughout the world. Some of the many institutions that have honored his work are the National Hospice Organization USA; McGill University, Montreal, Canada; The Hong Kong Society for Palliative Care; Chosun University South Korea; Toronto University, Canada; The Korean Society for Hospice and Palliative Care and the Hershey Medical Centre. In 1987 he received the Order of the British Empire and in 2005 the American Academy of Hospice and Palliative Medicine’s (AAHPM) Lifetime Achievement Award. More recently, in 2013 he received a special award from the EAPC, and in July 2014 The University of Glasgow awarded him the honorary degree of Doctor of Science. Dr. Doyle continues to take a great interest in palliative care and has been a regular contributor to the University of Glasgow End of Life Care Studies blog. He also spends time assisting with church initiatives for the elderly, frail and lonely.